Once upon a time there were these neat little self-published/self-printed "magazines" lovingly put together in someone's bedroom or basement, specific to the "publishers" interests and whims. Fanzines are what they called 'em, but by now they have all but fallen by the wayside, due mostly in part to *gulp* BLOGS! There was even a short running 'zine called Back of a Car, a tribute to the band Big Star, whom I've recently dedicated a post to. 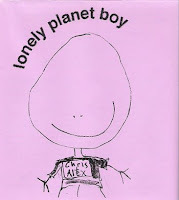 I never held a print copy of BOAC in my hands, but I did obtain an original copy of a zine sponsored compilation CD, Lonely Planet Boy, released in 1995. The centerpiece of this disk is arguably the first track, an up until then unreleased Chris Bell song, "Country Morn," later re-written as "Watch the Sunrise," with virtually the identical arrangement, but new lyrics. According to the liner notes, the song was issued on a flexi-disc with BOAC #2. Bell of course was one of the co-founders and lyricists for the pioneering, proto-power pop Memphis quartet. The rest of the disk is germane to Big Star, if only aesthetically. Featured are a clutch of contributions from Big Star "disciples," including such small-of-fame, underground pure-pop acts Tommy Hoehn, The Scruffs, and Outrageous Cherry. Sister Lovers flew the Big Star flag so damn high they christened themselves after the band's third album, while Norway's The Chairs penned a tribute song to Mr. Bell himself. There are some stunning relative unknowns on LPB too, namely Yuji Oniki and Mystic Eyes to further sweeten the pot. For your reading pleasure, I've scanned the entire zine booklet (essentially a double sided piece of paper) which provides pertinent band and zine info. Check out the links in my intro paragraph too. Zines live on in Halifax, Nova Scotia! Downloading now, but regardless of the quality I appreciate this kind of thing! no love for Buffalo's very own Mystic Eyes!?!? Thanks for posting this great comp with Buffalo's dazzling Big Star lovers Mystic Eyes!!!! And I have always loved the Chairs tribute to Chris Bell - a true classic!!!! Irving Klaws and Vores at the Mohawk tonight!!! !Andy Hummell at the Mohawk tomorrow!!!! Wow. I love the Big Star/Lemonheads/Replacements-related stuff you post. I never thought I'd get to hear that Replacements tribute album again that you posted last summer, and now I have an MP3 of "Country Morn," for which I still have the flexi-disc -- I ordered Back of a Car issues #1 and #2 in 1996. (I still haven't read #3, which I've had for 11 years now.) I even remember trading a few e-mails in '96 with Judith Beeman, who published BOAC, using my very first e-mail address, which I was given as part of an English class at the beginning of that year so our teacher could give us a few assignments that way. (I didn't truly become addicted to e-mail until '98. I still miss sending and receiving actual lettersm -- or fanzines -- in the mail.) In fact, that e-mail address still exists 13 years later on the Web at this address: http://zenandjuice.com/music/bigstar/text/3rdlyr.txt. BOAC led me to Todd Rundgren, who became my next big musical obsession after Big Star and Alex Chilton. I was going through some old letters the other night and found one from February 11, 1998, that came with my copy of BOAC issue #3. In it Judith Beeman wrote, "The BIG news tho, is I've just released *lonely planet boy* a BOAC compilation featuring the Chris Bell cut, a few originals written for the disc, 5 Memphis acts and other 7th-degree-of-separation material in the Big Star realm. It's great she sez shoving modesty aside. And a mere $8.00 will land a copy in your mailbox." She also mentioned returning home to Vancouver after attending the Poptopia event in Los Angeles. "Top bands I saw were BMX Bandits, Imperial Teen and 'Groop' who consisted of the rhythm section of Velvet Crush, Matthew Sweet, Tommy Keene and Parthenon Huxley, doin' a bunch of covers." YOW! Spavid thanks for putting up the Lonely Planet Boy CD and the kind words and link to my BOAC page. I am so ashamed to have let the page get to such a state with missing links, eons out of date material and, er ZERO mention of the 4th issue of BACK OF A CAR (or BOAC) which was "memories of being a teenager in the late 70's." The final issue had a companion CD "Teenster" with a whack of bands given the assignment to contribute a song with an am 70's sound. If anyone wants a complete set of BOAC and/or the 3 CD's (cheap)please contact me beeman@istar.ca for all the gory details. Nice to see your name and your comment. Sorry about not reading the third issue after 11 years -- I'm a really slow reader, I promise! -- but I will contact you about getting a copy of the fourth. MANY THANKS FOR THIS. NEVER KNEW IT EXISTED. FOUND IT VIA A BLOG REFERENCE TO THE TOMMY HOEHN TRACK. Thanks for posting this--just seeing it now, but better late than never, eh? I also own a copy of this fabulous cd--obtained for free while working at the record store Desireable Discs in Dearborn, Michigan many moons ago. It's one of my favorite treasures. It is very sad that 'zines have fallen by the wayside. There is something wonderful and exciting about having a tangible item that you can run your fingers over and smell and place up on the shelf. I find it sad to imagine a future of book-reading and music-listening to be an online-only thing, but I get the feeling that we're headed in that direction more and more. Anyway, to those of you who don't have this little gem, it is worth every penny. I think it's one of the best compilations out there. Most Big Star fans probably already know the Chris Bell track, but some other real standouts for me are "Boxtop," by Outrageous Cherry (I seem to be the only person I know in Michigan who has even heard of OC--and they're from Michigan), Yuji Oniki's "Cover" (my personal favorite), "Number One" by the Scruffs, and "Radiator Girl" by Sister Lovers. The rest are all great as well--there's no way you can go wrong. Can't believe I didn't comment here on this. In the present day after finding out about this from the site, I wrote (ok, emailed) to Judith and got the whole collection. Very well worth getting. A classic zine with stuff you would not find elsewhere (of course) and comp CD's of a quality many labels don't come close to. Thanks again for pointing me toward this. Really enjoyed the Big Star documentary and Holly George-Warren has compiled a biography about Alex coming out at the end of March. Can the band get any hotter?! Here's one that was recorded in 1993 that would have fit. Hey everybody, Judith Beeman here again. It just occurred to me I forgot to post here that all my BOAC zines and music, including the Lonely Planet Boy CD can be read and listened to at JudithBeeman(dot)com the site has been up for almost two years. ENJOY! Thanks Judith! Just saw your post now. Appreciate it. Would love to hear this comp. if anyone can post a re-up. Thanks! Seattleite, if Spavid (hey man!) doesn't reup this visit my website JudithBeeman(dot)com is still going strong. You can hear all the BOAC music and read all the zines.